and apply the fantastic power of daily market sentiment. Timing futures trades with the DSI Why Traders Lose, How Traders Win provides all the information needed to better understand, appreciate and apply the fantastic power of daily market sentiment. 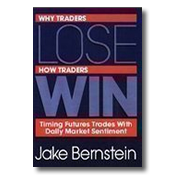 Drawing upon principles of trading, psychology and market opinion, Jake Bernstein provides operational strategies in which market sentiment can be used as a profitable trading tool. Topics include: - Social and Psychological Aspects of Attitudes and Opinions - Group and Mob Psychology - Traders' Perceptions and Expectations of the Markets - How Market Sentiment is Measured - How Market Sentiment Can Be Applied Objectively Contents: The Secret Life of Traders, How Market Sentiment Works, The Psychology of Attitudes and Opinions: A Brief Overview, Compiling Daily Market Sentiment, Applications of Daily Market Sentiment, Using DSI at Extremes, A “Diamond in the Rough,” Additional Application Principles of the DSI, and the DSIE, Bullish Divergence and Bearish Divergence.